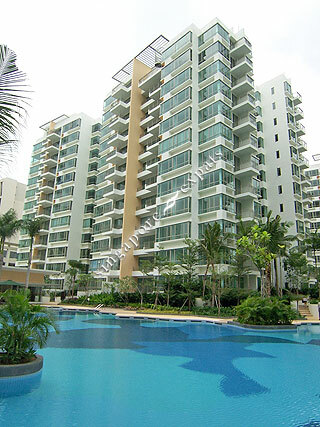 Casa Merah is a freehold condominium located at Tanah Merah Kechil Avenue off New Upper Changi Road, amidst a quiet residential enclave. Comprising of 12 blocks with 556 units, Casa Merah's clean lined and linear facade complements the indulgent array of water bodies in the development. Sited on elevated ground, higher floor units at Casa Merah can revel in the panoramic vistas of lush surrounds whilst units with private enclosed space on the lower floors can enjoy the exclusivity of an inviting water landscape at the doorstep. Meandering along ‘free-form’ footpaths, Casa Merah sets the stage for a truly soothing yet inviting resort ambience. In Casa Merah, meticulously planned layouts are conceived to maximise space and flexibility, with large windows inviting ample natural light into the apartments. For 4-bedroom apartment units, one gets the enjoyment of a large balcony that extends from the dining area offering a personal corner for leisurely activities or quiet indulgence. The modern kitchen in Casa Merah with well-equipped appliances satisfies the demand of every epicurean. Evoking an atmosphere of warm cosiness, Casa Merah makes coming home simply a pleasure. When it is time for quick bites or stock ups, popular food outlets and supermarkets are within close proximity of Casa Merah. For those who prefer al-fresco pursuits, East Coast Park and Laguna Golf & Country Club beckons. Enjoy the wonderful mix of leisure, food, and shopping conveniences with Tampines Mall and Parkway Parade nearby. In addition, the peaceful neighbourhood is replete with a range of good schools and institutions from St.Anthony’s Canossian Primary and Secondary School, Anglican High School to Temasek Junior College. Inspiring yet exciting, Casa Merah has it all. Casa Merah is conveniently located right next to the Tanah Merah MRT Station and easy drives via Pan Island Expressway (PIE) and East Coast Parkway (ECP), relish the ease of getting to the City and Changi Airport in minutes. Nice location but noisy, bad security allowing outsiders to come in easily / people cycling in basement car park / boxing in basement, dirty, toilet blocke easily. If you're looking for a noisy condo, where the every sound (from pressure cookers, domestics, yelling children up late etc.) reverberate through the poorly constructed building, this is the place for you. It was once nice. It's now dominated by a lot of very rude, selfish and noisy people, principally heralding from one place. The management are fond of signs and rules telling you all the things that can't be done, but there joyless quest is a failed one, as little attention is payed. Few more noise polluted and unfriendly places I've ever stayed in decades of moving around the world. Lifestyle living in the East! resort living in the East!